KoopaTV: KoopaTV Live Reacts: Nintendo Treehouse Live | E3 2018: Nairo vs. ZeRo in Mario Tennis Aces! 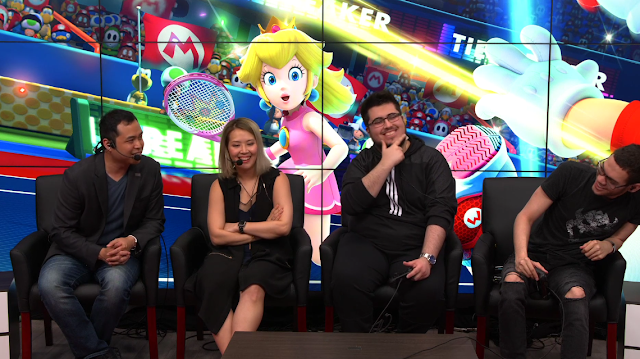 KoopaTV Live Reacts: Nintendo Treehouse Live | E3 2018: Nairo vs. ZeRo in Mario Tennis Aces! By LUDWIG VON KOOPA - Mario Tennis Aces is pretty awesome, isn't it? Not done for the day, the Nintendo folks at the Treehouse invite professional Super Smash Bros. players attending E3 to play the very competitive fighting-game-esque Mario Tennis Aces. You know what I put here. It's Rawk and me, and here's the E3 2018 schedule. King Bowser is in the log and we cheer for him. [6:36 PM] Ludwig Von Koopa: We're back. [6:36 PM] RawkHawk2010: Kinda seen enough of them. [6:36 PM] RawkHawk2010: Then again, this is a fighting game. [6:36 PM] RawkHawk2010: This and Smash are the same genre. [6:36 PM] Ludwig Von Koopa: Nairo is playing as Bowser. [6:36 PM] Ludwig Von Koopa: ZeRo are playing as Waluigi. [6:37 PM] Ludwig Von Koopa: Nairo secondaries Bowser in real life. [6:37 PM] Ludwig Von Koopa: Erm, in Smash. [6:37 PM] Ludwig Von Koopa: Wait what? [6:37 PM] Ludwig Von Koopa: Yeah. [6:37 PM] Ludwig Von Koopa: This is gonna help give us tips. [6:37 PM] Ludwig Von Koopa: Nairo has bad spacing here. [6:38 PM] Ludwig Von Koopa: ZeRo tried to return the Zone Serve before it bounced. [6:38 PM] RawkHawk2010: Music is good on this court. [6:38 PM] Ludwig Von Koopa: Nairo is making great use of Zone Shots and Zone Serves. [6:38 PM] Ludwig Von Koopa: I'm inspired. [6:39 PM] RawkHawk2010: People are definitely gonna have to learn to block Zone Shots. [6:39 PM] Ludwig Von Koopa: Let's see how Nairo deals with the Special Shot. [6:39 PM] RawkHawk2010: Or they're getting KO'd. [6:39 PM] Ludwig Von Koopa: He Zone Timed to block it. [6:39 PM] Ludwig Von Koopa: ZeRo only has 1 HP left on his last racket. [6:40 PM] Ludwig Von Koopa: ZeRo just ran away from the Zone Serve. [6:40 PM] RawkHawk2010: He's basically already lost. [6:40 PM] Ludwig Von Koopa: Now they both have full metre. [6:40 PM] Ludwig Von Koopa: ZeRo special shots. [6:41 PM] Ludwig Von Koopa: And Bowser Zone Speeds instead of using his special. 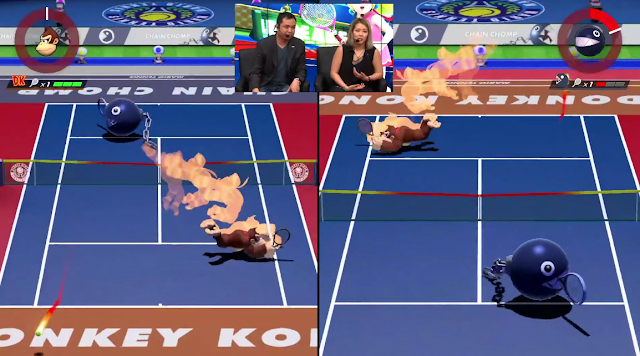 [6:41 PM] Ludwig Von Koopa: Nairo faulted his Zone Serve. [6:41 PM] Ludwig Von Koopa: Which I find myself doing. [6:41 PM] Ludwig Von Koopa: They've been in 40-40 deucing for a while. [6:41 PM] RawkHawk2010: I mastered it. [6:41 PM] Ludwig Von Koopa: Oh no. [6:42 PM] Ludwig Von Koopa: Nairo had no more metre. 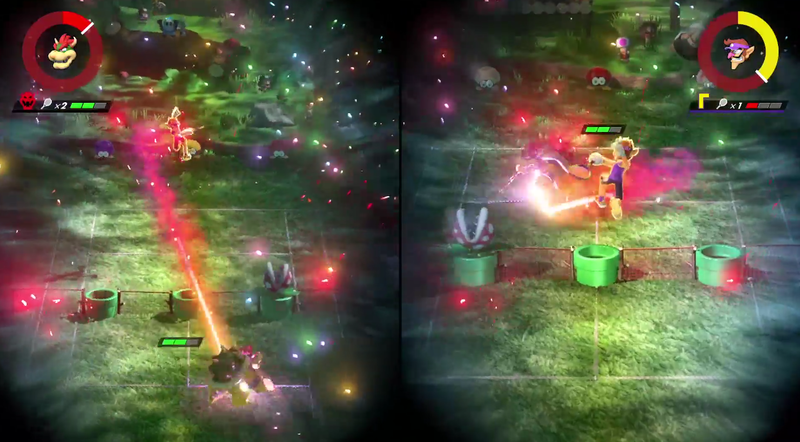 Nairo can't handle this particular hit, but Team Bowser will win shortly. [6:42 PM] Ludwig Von Koopa: GAME! [6:42 PM] RawkHawk2010: Does Zero know how to Trick Shot? [6:42 PM] Ludwig Von Koopa: That was all one game. [6:43 PM] Ludwig Von Koopa: Nairo wins. [6:43 PM] RawkHawk2010: There probably needs to be a way to repair the racket. [6:43 PM] Ludwig Von Koopa: You can change the settings. [6:43 PM] Ludwig Von Koopa: You unlock the courts by playing adventure mode. [6:44 PM] Ludwig Von Koopa: And can turn hazards off in them. [6:44 PM] RawkHawk2010: I didn't see racket HP as an option. [6:44 PM] Ludwig Von Koopa: Nairo with Boo, vs. ZeRo and Bowser Jr.
[6:44 PM] Ludwig Von Koopa: There's an option to not have KO as a win condition. [6:44 PM] Ludwig Von Koopa: I think I saw that. [6:45 PM] Ludwig Von Koopa: ZeRo just Zone Shotted. [6:45 PM] Ludwig Von Koopa: And again. [6:45 PM] Ludwig Von Koopa: Oh nevermind. [6:45 PM] Ludwig Von Koopa: Nairo is Bowser Jr. and ZeRo is Boo. [6:45 PM] Ludwig Von Koopa: Okay, then ZeRo hasn't Zone Shotted once. [6:45 PM] RawkHawk2010: Zero seriously doesn't know to Trick. [6:45 PM] Ludwig Von Koopa: Or Tricked, yeah. [6:46 PM] RawkHawk2010: K he did. [6:46 PM] Ludwig Von Koopa: But I don't blame him for not Trick Shotting. [6:46 PM] Ludwig Von Koopa: Nairo loves Zone Shotting with his metre. [6:46 PM] Ludwig Von Koopa: ZeRo just Trick Shotted. [6:46 PM] RawkHawk2010: Yeah that was his second time. [6:47 PM] Ludwig Von Koopa: Game set and match, Bowser Jr.
[6:47 PM] RawkHawk2010: Did Smash invent the Bowser Jr. boxing gloves? [6:47 PM] Ludwig Von Koopa: I'm pretty sure the answer is no. [6:48 PM] Ludwig Von Koopa: Donkey Kong vs. Chain Chomp. [6:48 PM] Ludwig Von Koopa: I'm guessing Nairo is Donkey Kong. [6:49 PM] Ludwig Von Koopa: Nairo did three Zone Shots in a row. [6:49 PM] Ludwig Von Koopa: DK's Trick Shot is a Banana Slamma. Apparently, the Banana Slamma is actually just a normal punch. Lame. [6:49 PM] RawkHawk2010: Isn't the Banana Slamma a punch? [6:50 PM] Ludwig Von Koopa: It's not slamming the ground with both your hands from a jump? [6:53 PM] Ludwig Von Koopa: ZeRo has 1 HP left on last racket. [6:54 PM] Ludwig Von Koopa: ZeRo actually won a game. But will he win the set? [6:57 PM] Ludwig Von Koopa: Donkey Kong just Zone Shotted into the net. [6:58 PM] RawkHawk2010: This is funner to watch than Smash. [6:59 PM] Ludwig Von Koopa: ZeRo and Nairo don't have mics. [6:59 PM] RawkHawk2010: This makes me like Scarf Boy more. [6:59 PM] Ludwig Von Koopa: That's impressive power. Rawk specifically has a grudge against ZeRo that has been softening slightly since today, as compared to yesterday. ZeRo is coming back to a log near you! The log before this is pretty unwatchable, featuring Daemon X Machina. ZeRo joins the next log to fight Leffen in Super Smash Bros. Ultimate.